One of the things I love about writing picture books is the surreal conversations I have with editors. Here are three of my favourites. Fair enough. When I wrote the text I didn't realise I'd be lucky enough to have Charlie Fuge illustrate it, and Charlie does amazingly naturalistic animals. 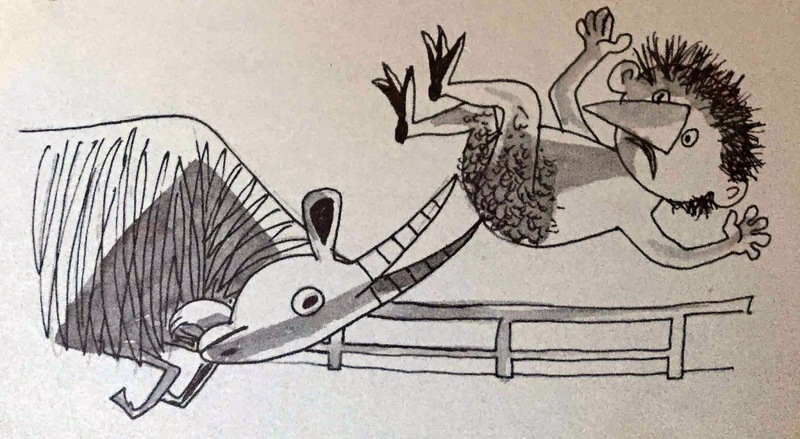 There's a fine line in the world of talking animals, and it has a lot to do with whether the illustrator is drawing the animal clothed or unclothed, in a natural or unnatural surrounding. Unclothed animals in a natural setting don't bake cakes. The only trouble was, the pivotal point of the story involves a birthday cake. We settled on a raw concoction of bananas and peanuts. 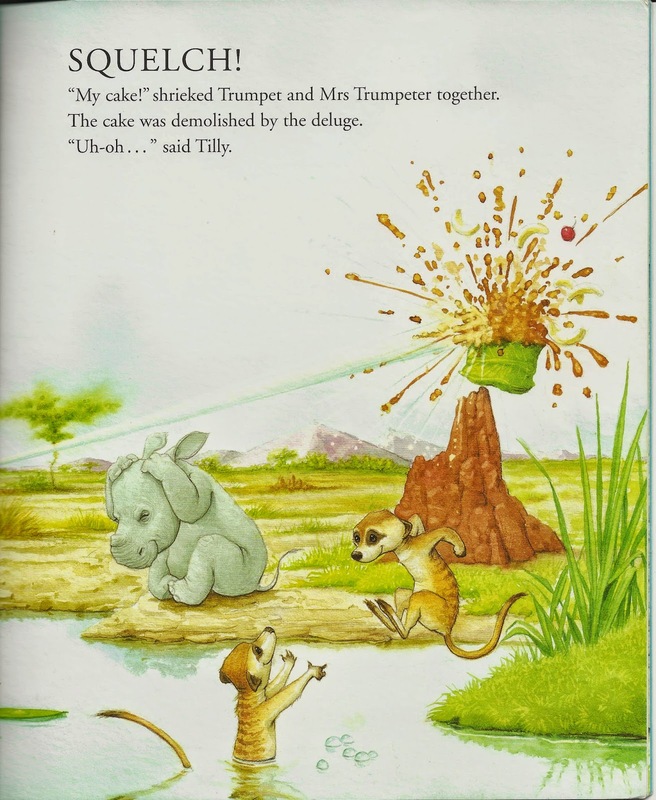 From Trumpet, the Little Elephant with the Big Temper, illustrated by Charles Fuge. I'm delighted to say that Charles Fuge is the illustrator of my upcoming picture book 'Who Woke the Baby', to be published later this year. No cakes are involved. Once you give a talking animal (and an imaginary one at that) a voice it has to sound authentic, so the question is a valid one. Saying the same thing was a useful device to emphasise their parallel thoughts and feelings. Essential in real life, but not in picture books. No problem if the cow is in the field, but udders are somewhat disturbing when a cow is standing on its hind legs. 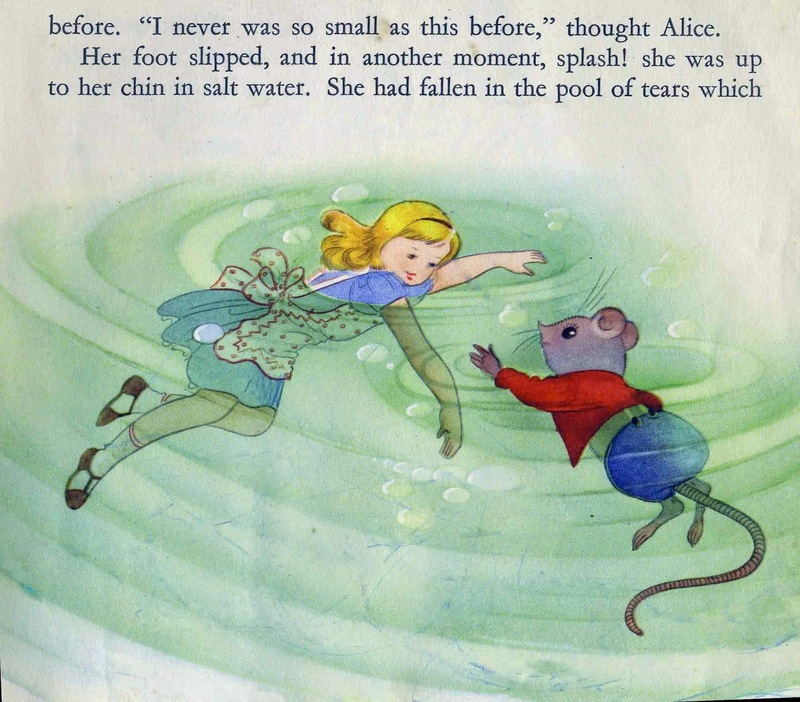 In picture books, dangly bits of any kind, belonging to any sort of clothed/unclothed/partially clothed creature, are most notable by their absence. Some of the cast of Old Macdonald's Things That Go, in the process of being illustrated by Migy Blanco. Picture book editors, writers. illustrators and readers, I'd love to hear your surreal quotes! 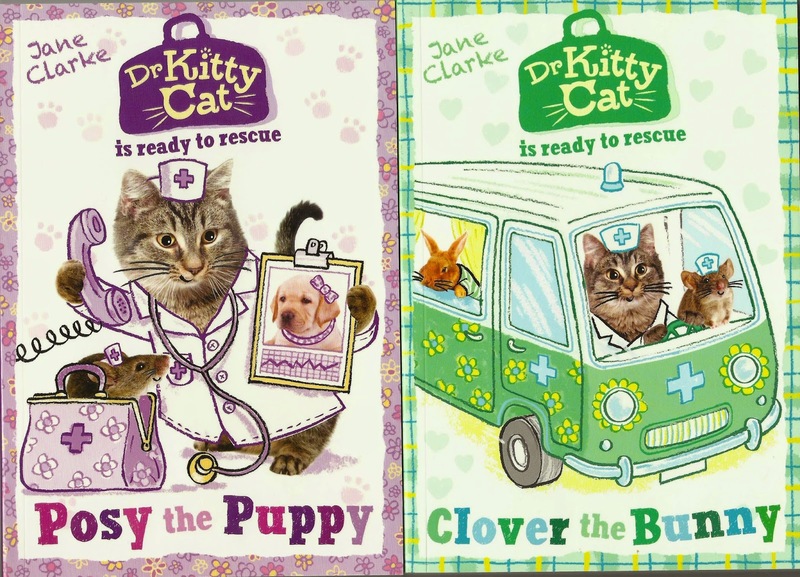 Jane's currently doing lots of school visits in the run up to World Book Day and launching the first two books of a new series published by Oxford University Press on 5 February 2015. 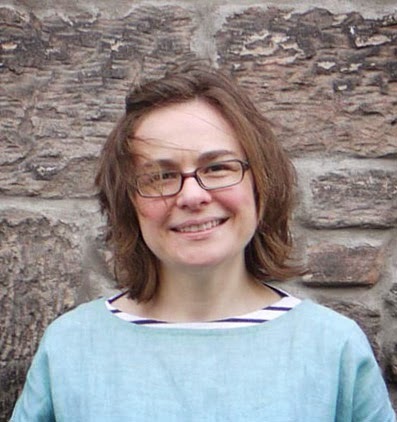 Many thanks to this month's guest blogger, Mandy Stanley, a British children's author and/or illustrator of over 200 publications. 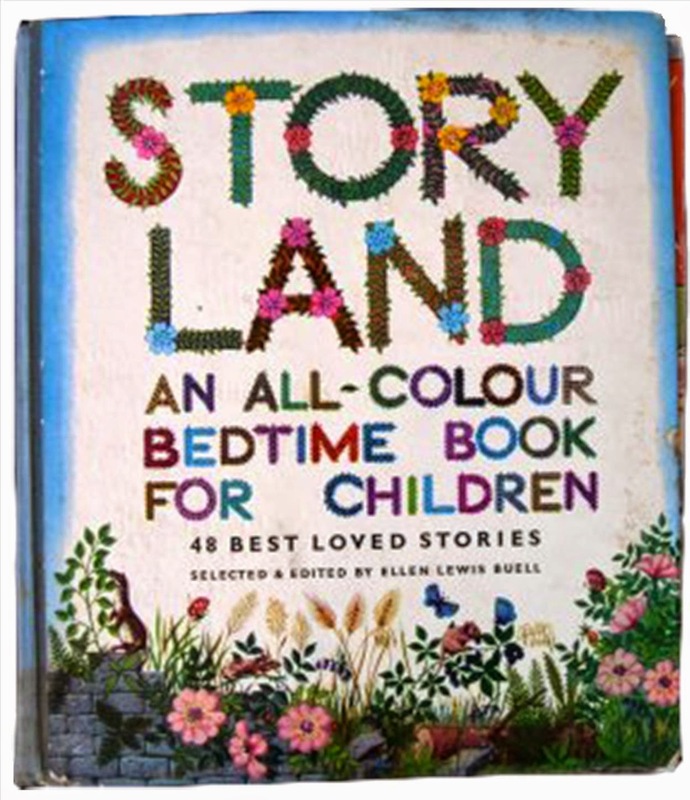 Here, Mandy looks at how the books of her childhood have impacted on her ideas, illustrations and colour schemes. 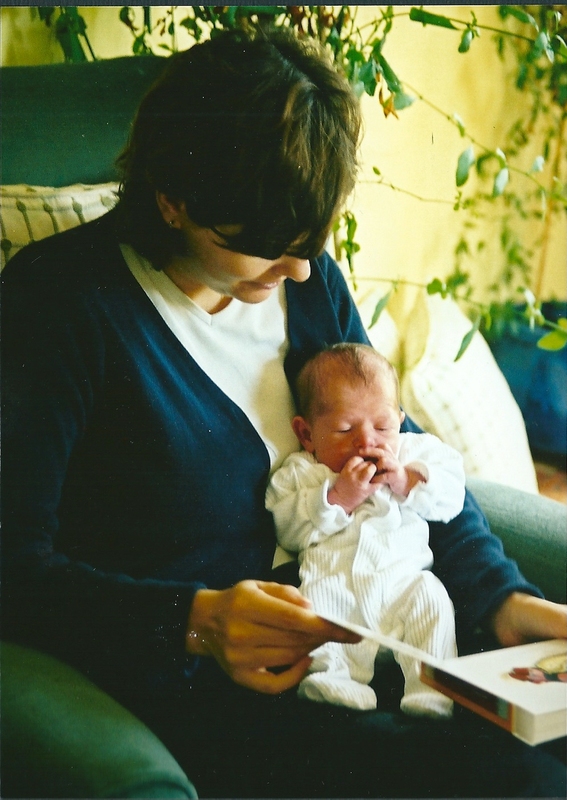 Being a children’s author and illustrator for the past twenty-five years, there are many subjects I could write about but what really interests me at the moment is the relationship I had with books as a child. I’m keen to discover if there are any links between those books I read and listened to and loved so much as a child, and those I write and illustrate for today’s children. Looking back, Middleton Primary School near King’s Lynn is one of the first places that come to mind when I reminisce about my childhood books. I was often the ‘new girl’ at school as my father moved around a lot with his work. Every school presented certain challenges to me as I was afflicted with being shy. But… the one single thing that helped me to cope in the early years was the story mat – thankfully, every junior school classroom had one. Here was a place to feel safe, surrounded by other children sitting quietly on our rectangular island, listening to stories and being shown wonderful pictures. As a six year old at school, books came to represent so much more than just a story and pictures. 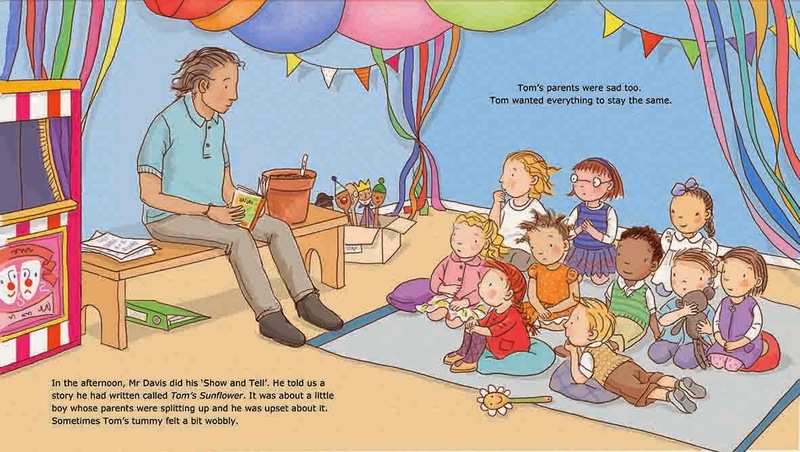 It occurred to me that having completed an illustration for Tom’s Sunflower by Strauss House Publications, written by Hilary Robinson, that I had been drawing on my own experience of feeling safe on the story mat. The Copper Tree Class children learn about all sorts of difficult subjects, and subliminally, throughout the series of four books, I’ve placed them on their mat as a device to show they are all connected and will learn from each other’s experiences. My grandparents and parents were instrumental in giving me a love for stories told and those written in books. At the table, my grandfather told stories of his adventures on the high seas as a Lowestoft trawlerman, and of being a soldier and railway man. He brought his stories alive by referring to things as being the size of his plate or the salt pot. 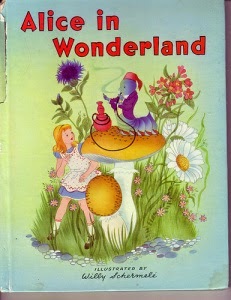 My grandparents gave me the first book I remember as a Christmas gift when I was very little. 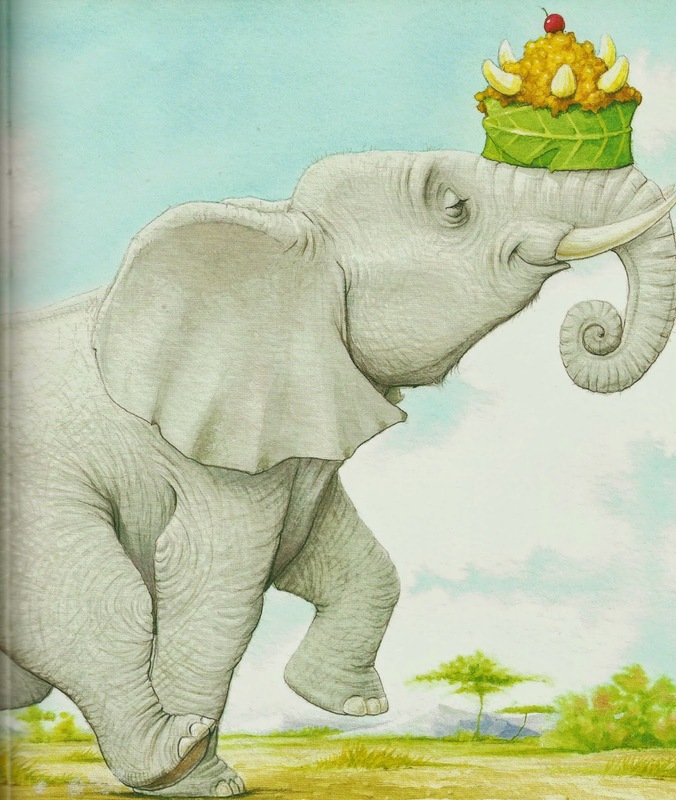 The illustrations in Storyland intrigued, delighted and transported me to a wonderful place. Years later, I discovered that Mary Blair, famous for her work with Walt Disney, illustrated many of the stories. On Saturdays, my dad took me to the library. He enthusiastically went off to choose his books and left me in the children’s section to discover the books I wanted to borrow. At the checking out desk, I’d meet my father. We both had a stack of books that we wanted to investigate further, at home. 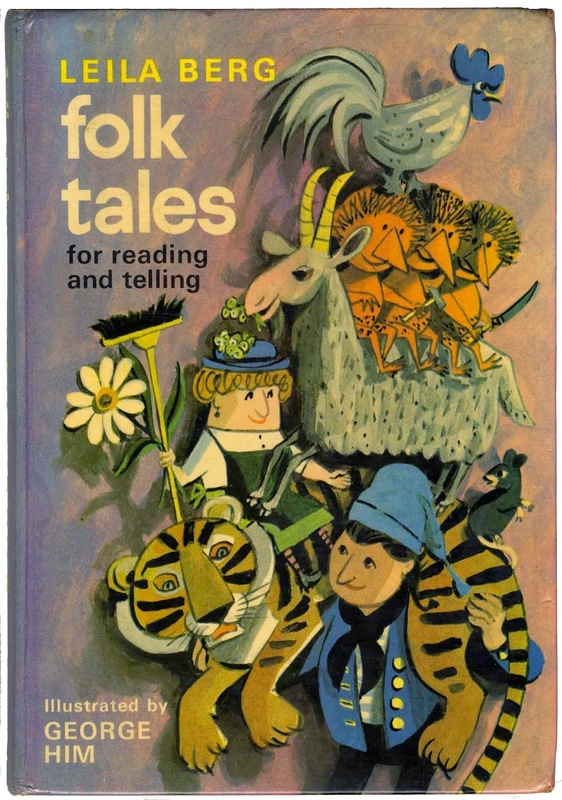 The book Folk Tales was one of my favourites as it contained beautiful illustrations and the story The Billy Goats Gruff. The troll, I’m convinced, still lives under the little bridge in the Nicholas Everitt Park, Oulton Broad, Suffolk! Along with borrowing books, I have been given books, I’ve swapped books, found books, received handed down books and I have stolen books (mainly from my sister!). 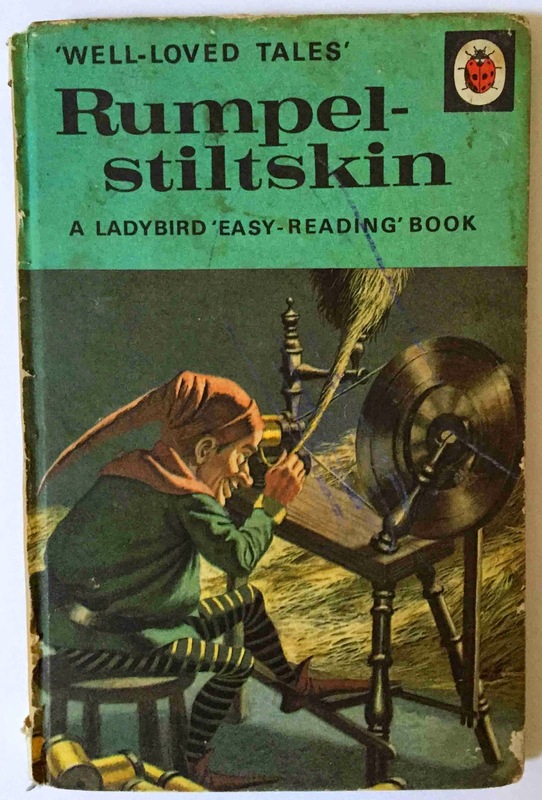 Amongst my collection, I can’t imagine not including two of my best-loved traditional fairy tales: Rumplestiltskin and The Elves and the Shoemaker. These stories inspired, scared and delighted me in equal proportion. Occasionally, even now, I sometimes wish that a couple of elves would come along in the night, while I sleep and finish off my work for me. I know that I would be more than happy to reward them with a new set of miniature clothes. 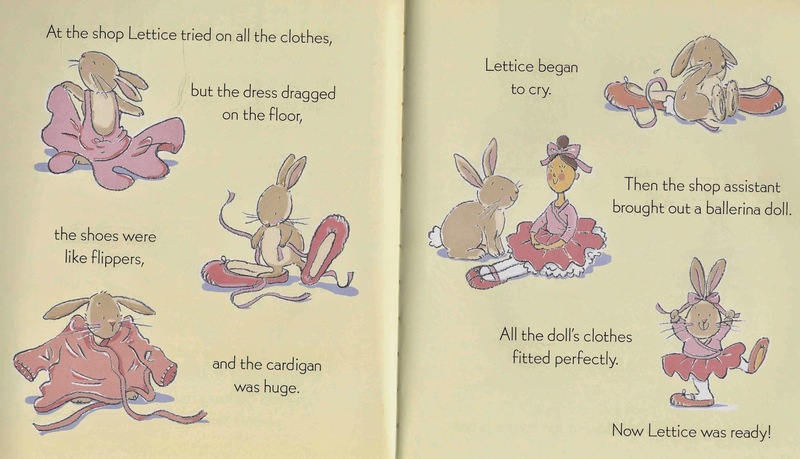 This reminds me… Lettice Rabbit requires a set of ballet clothes in Lettice The Dancing Rabbit – Harper Collins. Although children offer her their clothes to borrow, they are all too big. Luckily she is able to borrow a set of clothes from a ballerina doll. I’m sure the memory of the little elves must have been to the forefront of my mind at this point in my Lettice Rabbit story. 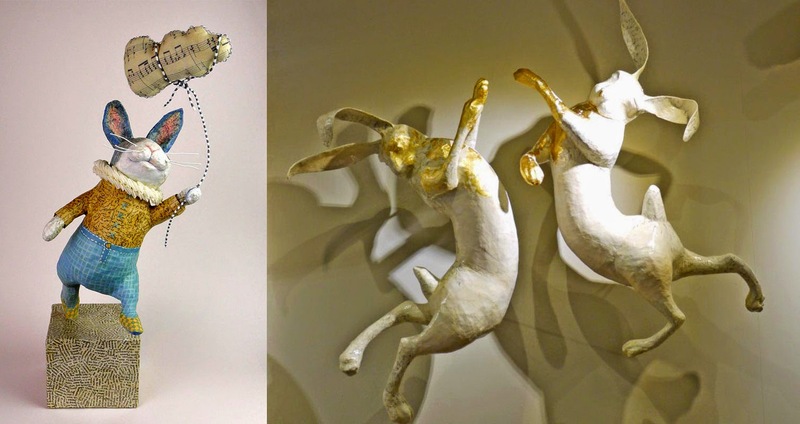 Lettice, The Dancing Rabbit by Mandy Stanley. I’m not sure I really know why, but the idea of a small character existing in our world is always appealing to me. 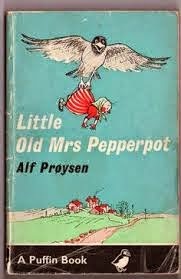 Mrs Pepperpot stories by Alf Proysen were always a source of entertainment. The very idea that a human could shrink to be very small…without warning, fires up my imagination. 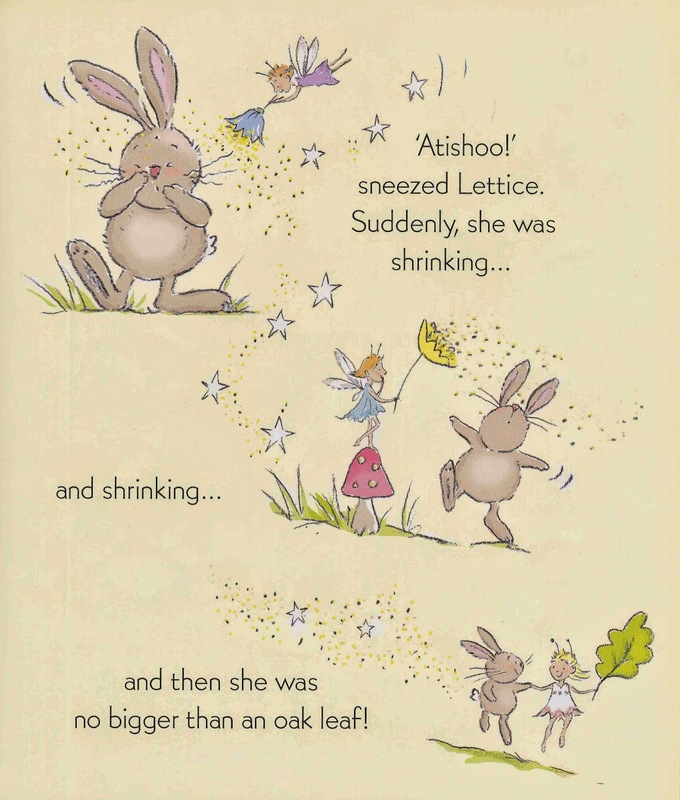 So, my Lettice Rabbit series must have been influenced by Mrs Pepperpot stories – Lettice shrinks! She becomes the same size as a fairy. Throughout the series, my interest and inspiration comes from the idea that Lettice is a small character that hops into our big, human world. 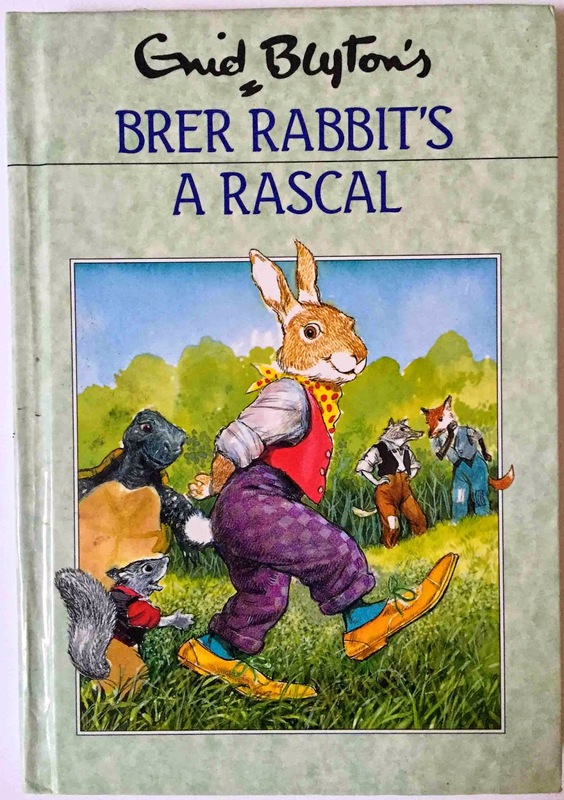 Brer Rabbit’s A Rascal by Enid Blyton. Another character that fascinated me was Brer Rabbit. 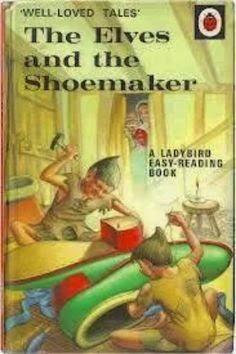 My grandmother read this book to me. She had a big feather bed and when I stayed overnight with her, I would take my book and slip into her bed in the morning, once my grandfather had got up to make breakfast, and ask her to read to me. 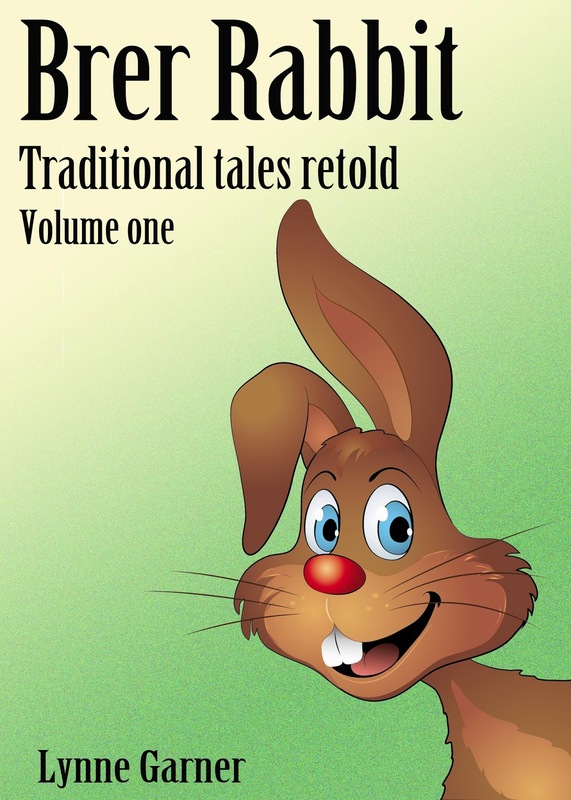 I discovered that Brer Rabbit was indeed a rascal… and very clever… and I loved him for it. Any links with Brer Rabbit and my own work are not apparent at the moment, although I do have an ambition to create a character that manages to escape all sorts of troublesome situations using wit and a daring attitude ! It wasn’t all fairy stories and fluffy rabbits in my eclectic hoard. 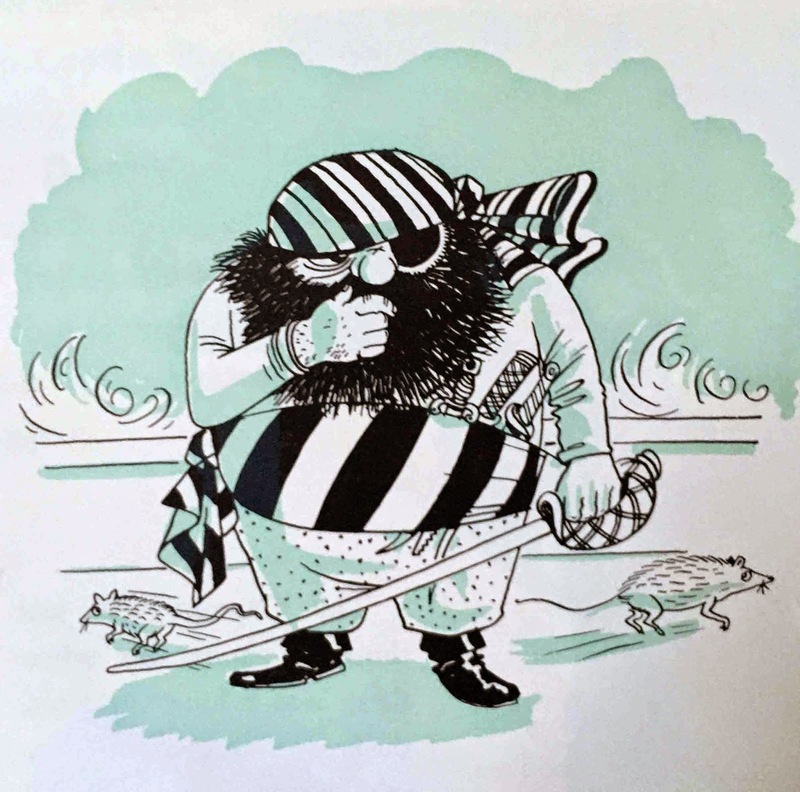 My father bought and read to me Treasure Island by Robert Louis Stevenson and Captain Pugwash by John Ryan. Billy Bones, Long John Silver and Cut Throat Jake – all fabulously intriguing sounding names. Working out new character names in my books is certainly one of the most enjoyable aspects. Along with remembering stories and images, what does intrigue me is that I also vividly remember the feel and aesthetic of every book. One Christmas morning I unwrapped a colouring book. On the cover, it had red flocking on Santa’s coat, hat and trousers… wonderful! I also noticed that books’ pages varied in their paper quality – ranging from thick, dry and sturdy, or wafer thin and slippery, delicate and almost transparent. There were paper engineered sections, high gloss effects, metallic foiling… even glitter! All these things added up to make a full sensory experience. Interestingly, I’m often heard to be requesting textural features on my own books today. 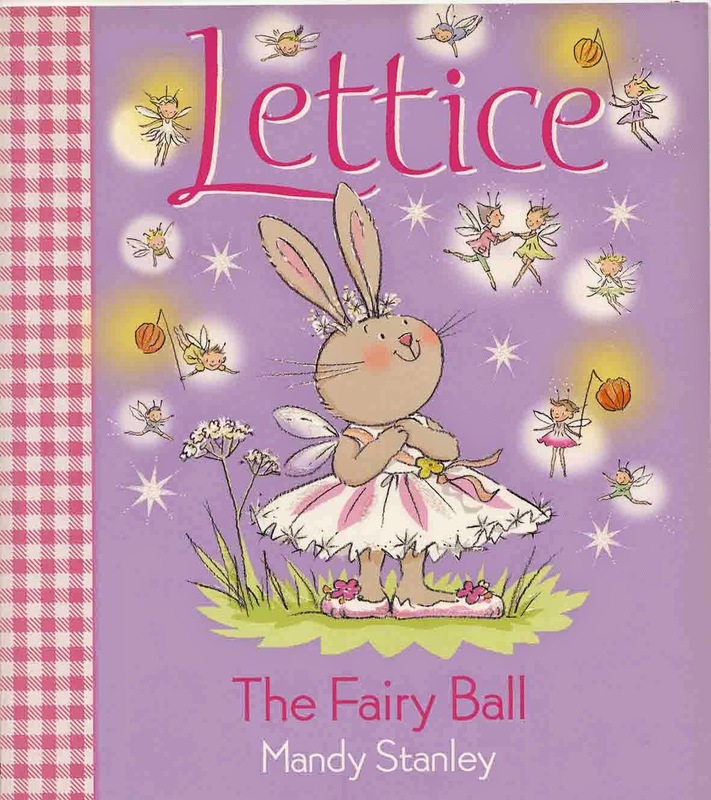 One of my wishes was granted when Harper Collins added a set of battery operated, twinkling fairy lights on the cover of Lettice, The Fairy Ball. As an illustrator, I spend much of my time working out colour arrangements and palettes for each project. Recently, while working on a collaborative project with author David Bedford, Roo the Roaring Dinosaur, I realized that, subliminally I was referring to a set of colours for a lagoon scene as Alice in Wonderland blues. 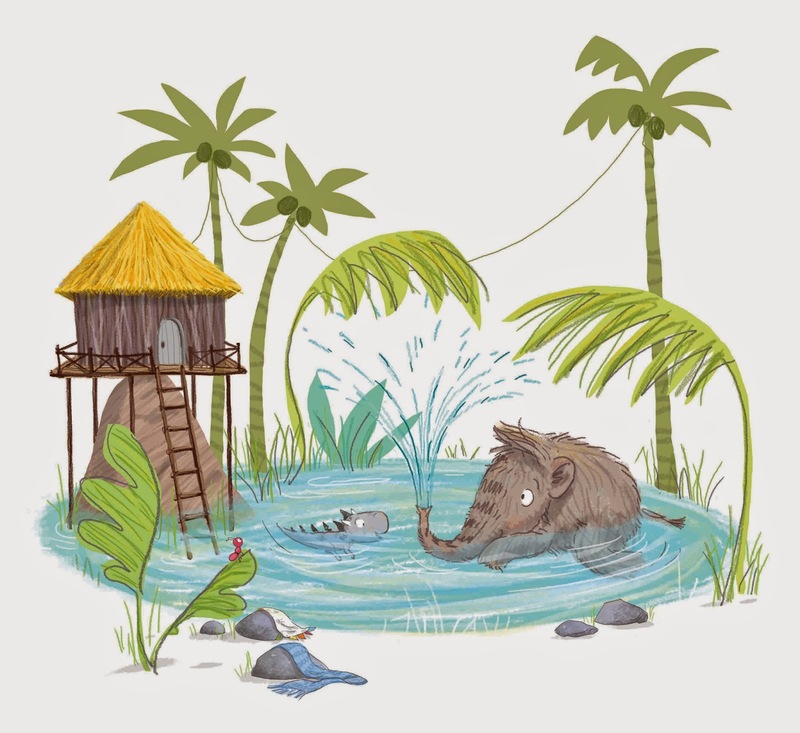 The image of Alice swimming in a pool of tears came to mind as a treatment for my illustration featuring Wooly, the mammoth and Roo the dinosaur splashing around in the blue lagoon in dinosaur land. Other colour references I use regularly include Peter Rabbit blue – (referring to his jacket). Babar green (his suit), and Rupert Bear yellow (his scarf and trousers). Spending time, thinking about my childhood, has reinforced my belief that books keep on giving. They stimulate memory and of course, provide comfort and entertainment. As an illustrator, they also provide me with valuable references. I continue to still be inspired by picture books I listened to or read for myself all those years ago. So the connections are there to be found… it’s fun and satisfying to recognize them. Creating books for children, hoping that some of them may provide a similar level of entertainment and trigger good memories for many years to come is, I think, a significant driving force behind my work. 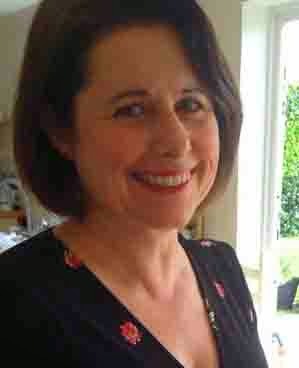 Mandy Stanley – Children’s author and illustrator. 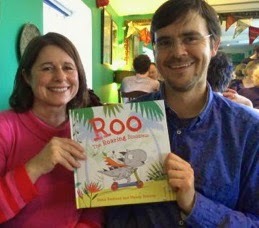 January 29th is the publication date for Mandy Stanley's latest picture book: Roo the Roaring Dinosaur, a collaborative work with David Bedford – Published by Simon and Schuster. When my children were little they were an endless source of ideas for picture books. They had great words for things - we still say 'starvint' instead of 'starving' to this day after my daughter used to cry out "I'm starvint!" My son made up fantastic names for his soldiers like 'Massimao' (who was one of his top colonels). When my dog dies I will not be sad. This is because that's when I will be getting my baby tigers. I will get 100 baby tigers. I will get them from a tiger den. The mummy tiger will say: "Go with that nice family!" or maybe the daddy tiger will say it. I don't know yet. When they are first born the tigers will sleep in my sister's bed. Then when they are older they will sleep in my bed. When they are big they will have to be good and not growl or bite people. …I will hoover them up. But now my two are in secondary school. 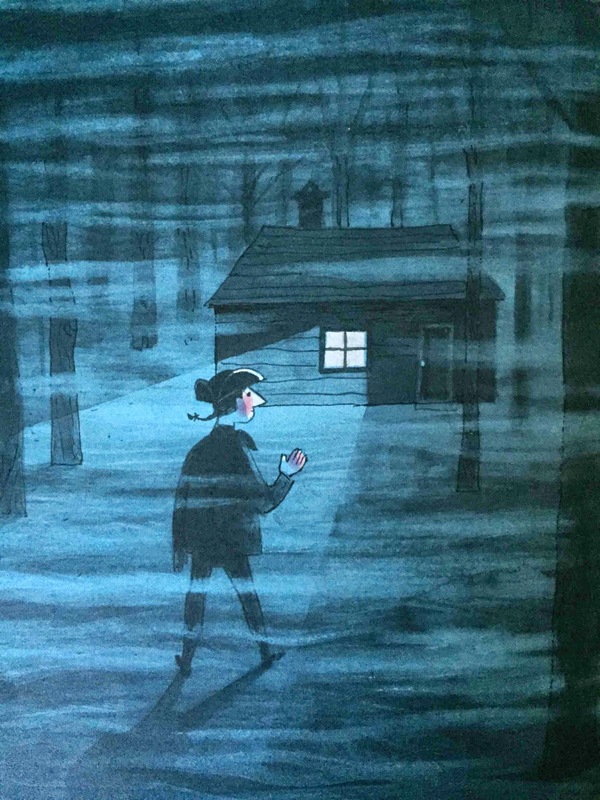 They still love picture books (especially the longer ones, like Ardizzone's wonderful 'Tim all Alone') but they are a little too old to be of useful inspiration. 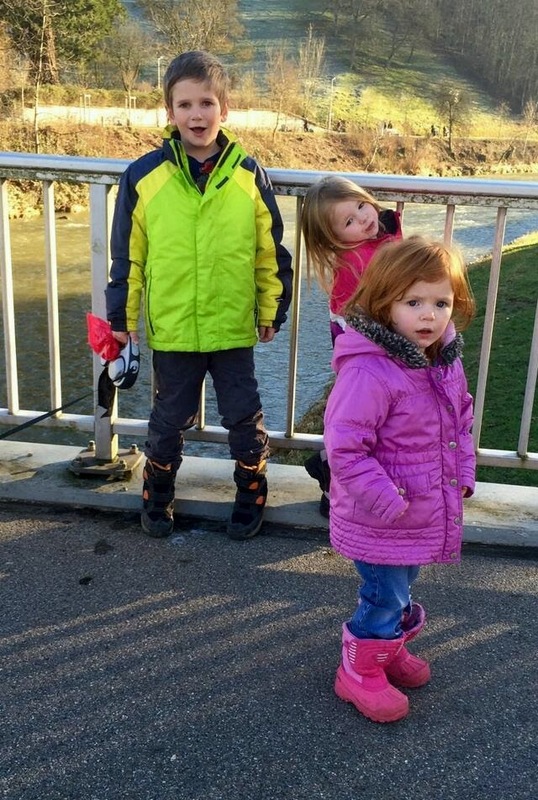 Luckily, this Christmas I spent a week with my sister's three children, who are both incredibly cute and incredibly pesky; a perfect source of inspiration. We read books (sometimes over and over. The little niece had a particular obsession with the Ahlbergs' Bye Bye Baby). We made up a crazy story about a butterfly who hated the rain and needed an umbrella. And a crocodile who snapped at Father Christmas while he was delivering presents. And a playdough baby whose arm kept falling off. There were rows about naptime, dummies, food, using the potty, whose toy belonged to whom. There were plenty of cuddles during the day. And alcohol once they had gone to bed. It was wonderful - and very inspiring! 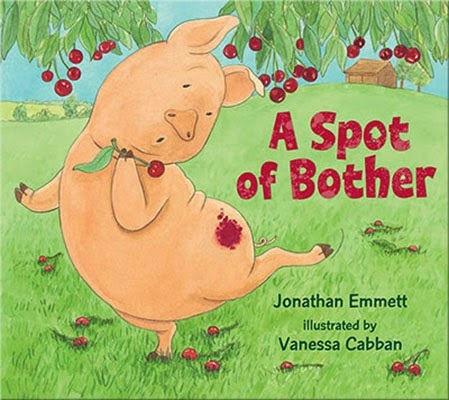 I have a new picture book, A Spot of Bother, coming out next month. 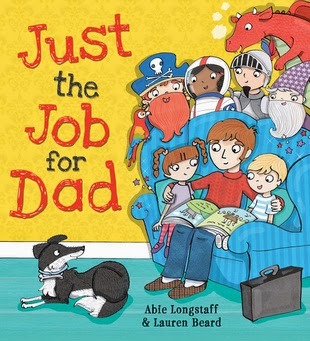 Having a book published is usually a cause for celebration, but the publication of this particular book is tinged with sadness as it will be my last with illustrator Vanessa Cabban, who passed away shortly before Christmas. 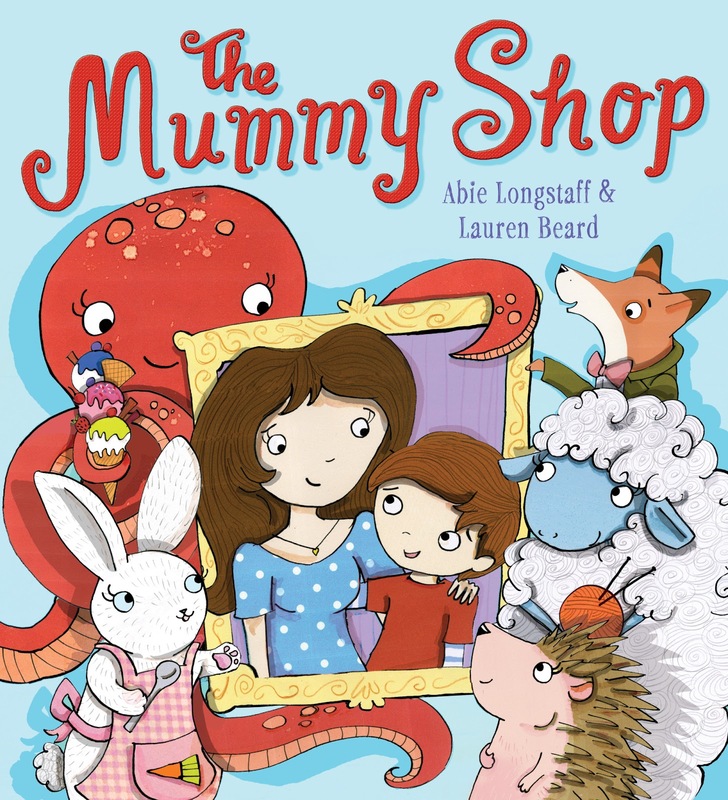 People often assume that picture book authors and illustrators work closely together, but it’s not unusual for the author and illustrator to have no direct contact, with the book’s creation being co-ordinated by the publisher. 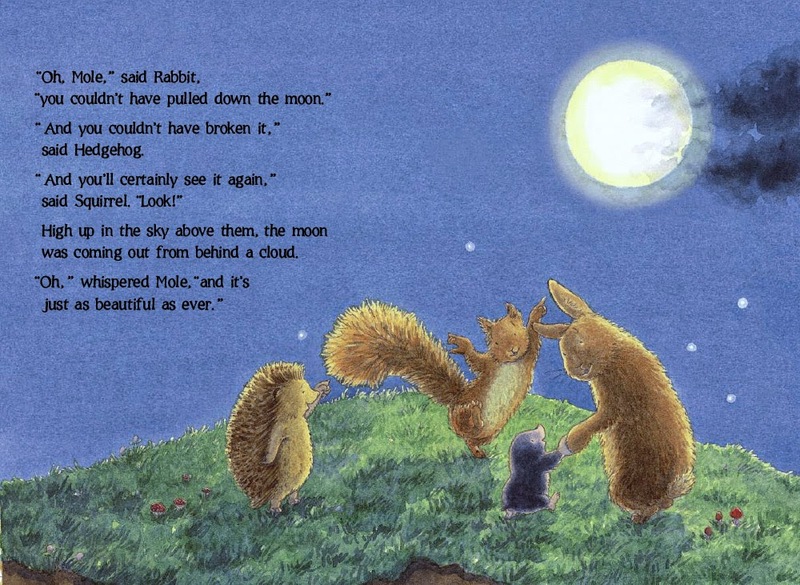 This was the case with Bringing Down the Moon, which was the first book that Vanessa and I created together. A couple of years after Bringing Down the Moon was published, the book won the Kiekeboekprijs, a Dutch book award, and Vanessa and I went to Amsterdam to accept it. Although we’d now done a second picture book together and Vanessa was about to start illustrating a third, it was the first time we’d met or even spoken to each other. Vanessa turned out to be stylish, funny and refreshingly frank and forthright in her opinions – we spent a lot of our visit in good-natured argument! By the end of our short stay we were firm friends. We resolved to keep in touch and did so regularly through many emails and lengthy phone calls over the following years. We both shared a mischievous sense of humour and our conversations were nearly always punctuated by laughter. 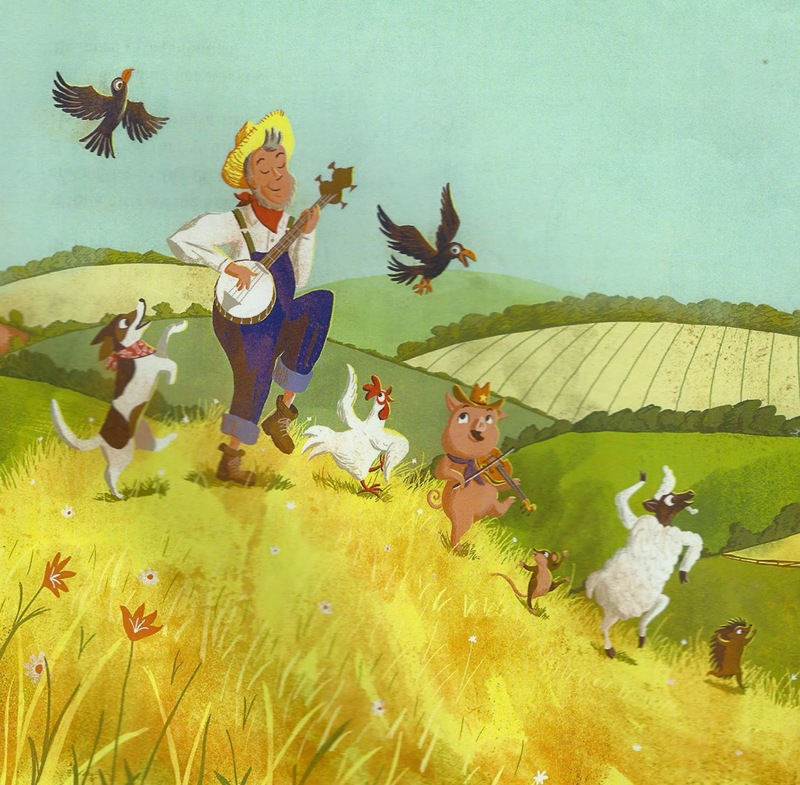 In addition to the seven books we did together, Vanessa illustrated many other picture books, written by Alan Durrant, Giles Andreae and several other authors. 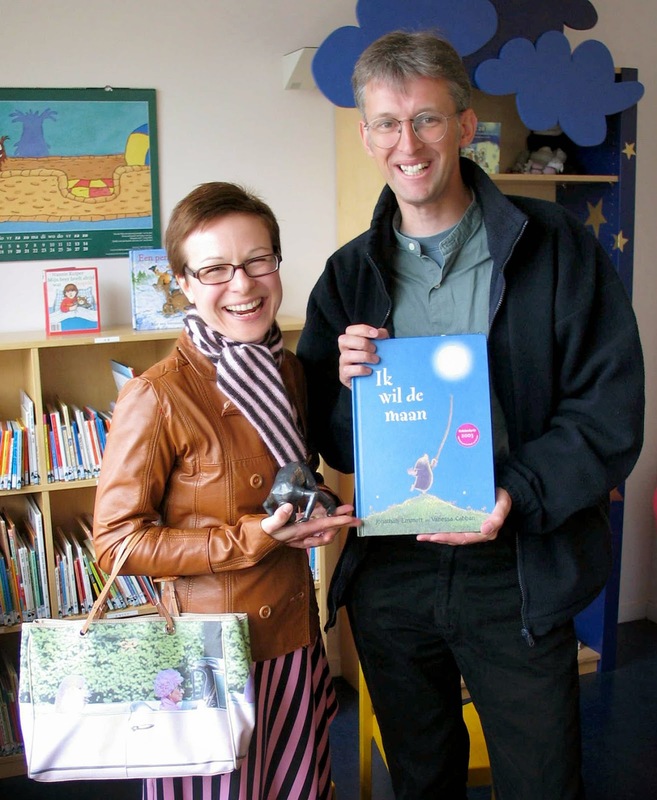 And she both wrote and illustrated two Bertie and Small picture books about an adventurous toddler and his toy rabbit. Vanessa had no children of her own, but was very fond of her niece and nephew and was a much-loved aunt, sister and daughter. Vanessa artistic talents extended beyond illustration into fine art and her paintings, prints and sculptures were exhibited and sold in various galleries around the UK. 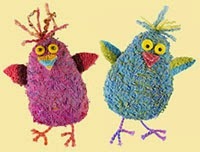 She was also an accomplished knitter, posting photos of her handiwork on her "Do you mind if I knit" blog. One of the pleasures of creating a picture book with another person is that one can draw on their strengths as well as one's own. Vanessa brought her own distinctive charm, warmth and humour to all the books that we created together. She was a good friend and a wonderful, inspiring person to work with. I will miss her dearly. In memory of Vanessa, her family have set up a Just Giving page where you can make a donation to the Mental Health Foundation. 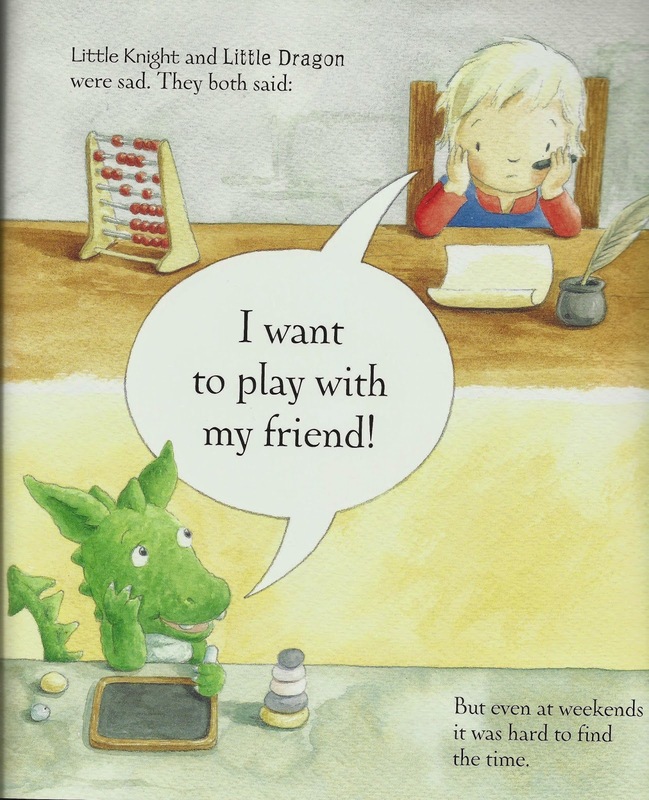 A Spot of Bother, illustrated by Vanessa Cabban, is published by Walker Books on 5th February 2015. A few years ago I ventured into writing stories for older children based on traditional trickster characters, these being Anansi the Trickster Spider and Brer Rabbit. This move away from picture books meant a great deal of reading and research, which I’ve thoroughly enjoyed. As part of my research I downloaded a huge library of books that contain the first written form of many of these traditional tales. Reading some of these books was a challenge because of the language used. As I read these traditional stories I always had at the back of my mind the age range I was writing for. So I put aside the idea of using the devices I often use in my picture book writing such as rhyme, rhythm and repetition and others such as alliteration. I also had to remember I wouldn't have images to help me tell the story. However this recently changed whilst I was researching a new trickster character, this being Coyote. As I ploughed through yet another book I came across a story which for some reason demanded “turn me into picture book.’ As I read it I could see where I could use repetition, feel the rhythm I would create with the words, how I could leave sentences 'hanging' so the reading would want to turn the page, where a little alliteration would work well and I could 'see' the supporting images which would help me tell the story. I found myself grabbing a piece of paper, folding it into twelve equal sections and I was soon plotting a new picture book story. I now find myself with the first draft of a picture book story based on a traditional Native American Indian story. I also find myself wanting to revisit the books I read whilst researching Anansi and Brer Rabbit to discover if another story makes the same demand. So over the next few months I plan to continue to work on the stories for older readers. However I’m also going to read with the view that if one of these traditional tales makes the same demand I’ll fold a piece of paper and get out my little bag of picture book writing tricks and try to make it’s wish a reality. You never know one of these may just become my next picture book.